NEW YORK, February 10, 2014 – WAT-AAH! bottled water for kids and its CEO/Founder Rose Cameron announce Taking Back the Streets, a celebration of street art in honor of Drink Up, an initiative of the Partnership for a Healthier America (PHA)-an organization focused on ending childhood obesity by working with the private sector and its honorary chair First Lady Michelle Obama-that encourages Americans to drink more water, more often. WAT-AAH!’s Taking Back the Streets initiative is a national art campaign that intends to reclaim the space where kids live, by replacing the information and visual stimulation that bombards them every day with new messages about healthy hydration. The most powerful messages that connect to kids and teens are not only found in magazines or on television, but also in the streets. For the first time, street art is being harnessed to reach this most important demographic. Leading street artists will change the way kids think about water and hydration. Through art and culture, they are spreading the word that water is anything but boring! Taking Back the Streets kicks off with a star-studded, celebrity-filled, invitation-only art exhibition at the New Museum in NYC on February 20, 2014, 8-11 PM EST, displaying the work of 14 artists including Kenny Scharf, Shepard Fairey, Swoon, Shantell Martin, Trey Speegle, Lichiban, Concep, Metro Zu and more artists, to be announced. This exhibit will also showcase a special tribute to Kenny Scharf and Keith Haring for their extensive efforts in engaging youth with the arts. 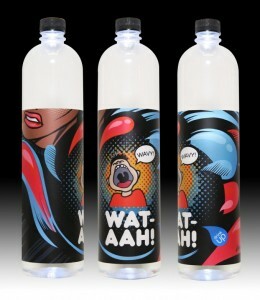 Each artist will showcase an original piece of artwork inspired by WAT-AAH!’s iconic screaming boy logo, Drink Up’s water drop logo and/or communicates water in general that will be transformed into label art for WAT-AAH!, creating a new series of limited edition WAT-AAH! bottles. The series is part of a yearlong exhibition that will visit New York City, Washington D.C., Philadelphia, Los Angeles, Miami, and other cities. Street murals tagged by various artists involved in the project are also expected to pop up around the city in the days leading up to the event. One such mural now appears in SoHo, on Lafayette & Jersey Streets by artist Metro Zu. City dwellers-especially kids and teens-are encouraged to keep an eye out. In New York City, WAT-AAH!’s Taking Back the Streets will continue with a pop-up exhibit for the general public from February 22 – March 1, 2014, at WallPlay (www.wallplay.com), 118 Orchard Street (at Delancey) New York, NY. The exhibit can be viewed seven days a week from 11:00 AM – 7:00 PM.